If you’re looking for a cool fire screensaver for your Mac look no further. 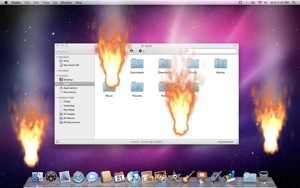 Aurora Screensaver allows you to start fires all over your Mac desktop by the use of your multitouch trackpad! Each finger burns it’s own fire, it’s really quite fun to play around with. Since multitouch input is used, you just have to hit a key to exit the screensaver. This is Snow Leopard only and requires a trackpad. I found this digging around on Apple.com and am quite pleased with my new ability to have a fire on my Mac desktop! Surprisingly entertaining! Download and Developer links are dead. Just wanted to give you a tip. You should not require email, etc. It is a turnoff and you could lose valuable input. « Get your Mac desktop ready for Christmas!